What are the Swedes doing with their national heritage? I’ve had this CD in my collection for almost two decades, and it didn’t leave a strong impression back then, but I decided to pull it out of the shelf when I saw that it was the odd-CD out, sandwiched between CDs that I’ve reviewed, of Barry Anderson on the left side, and of Louis Andriessen on the right side (I have a number of CDs by Louis’ father Hendrick, but they are not yet on the shelf either because they are part of collection CDs which are shelved elsewhere, or because I’ve bought them recently and haven’t yet listened). “Pe’l piacer di porle in lista”, for the pleasure of adding her to the list: there’s something of Don Giovanni in every collector (or there’s something of a collector in every Don Giovanni). So it was time to give a new try and a review to Elfrida Andrée. Well, I must have mellowed over the years. Listening to so much music by the towering giants AND the “minor” composers has made me more tolerant to the latter, and open to the beauties that even their works have to offer. They may be minor beauties, but they are enjoyable nonetheless. The younger sister of a famous opera singer, Fredrika Stenhammar (married to the uncle of the composer Wilhelm Stenhammar), Elfrida Andrée was a feminist figure “avant la lettre”, becoming the first cathedral organist in the history of Sweden (the law even had to be changed for her to be authorized to be a professional organist, and another one had to be changed to allow her to be a telegraph operator, a profession until then reserved to men) – and the only one for the next 120 years, for a short time the pupil of Niels Gade, writing symphonies and operas at a time when it wasn’t even conceived that women could write anything else but Lieder and chamber music. She had to hire the Gothenburg Symphony Orchestra to get her works tried out. Her catalog of works numbers about a hundred. Apparently it took her a number of years to complete her second symphony – as Mahler, she seems to have composed in the summer months. It was finished in 1879, but since the Gotenburg Orchestra had by then just disbanded, it was performed only in 1893. A “minor master”, then: don’t expect symphonic Brahms. 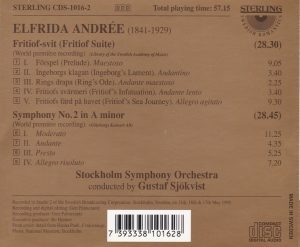 But the liner notes recount that at the end of the score of an overture she composed in 1865, Andrée inscribed “Mendelssohn lives on”, and that’s what you’ll hear: a derivation of Mendelssohn, without perhaps the unique melodic gifts and peppery bliss of Mendelssohn, but still a well-written and enjoyable symphony in that style. The symphonies of Bruch, which I’ve much enjoyed, also came to mind, although I haven’t checked back on them to verify if my impression was right. Rather backward-looking for the time of its composition, which may explain why Andrée’s glory remained very local, but more than 150 years later these chronological subtleties don’t count for much and we can concentrate on what the music has to offer, independent of the consideration that it offered it some thirty years too late. The Fritiof-Suite is a later work and the offshoot of an unsuccessful opera project for a competition statged by the Royal Theatre in Stockholm in 1894, on a libretto by Selma Lagerlöf – very prescient, as she was later (1909) to be awarded the Nobel prize for literature. The opera didn’t get a prize and Andrée was never able to have it performed. She derived the Suite in 1897. The liner notes talk about an influence of Wagner’s music, which Elfrida would have known through her soprano sister, but I don’t hear much of it in the music. 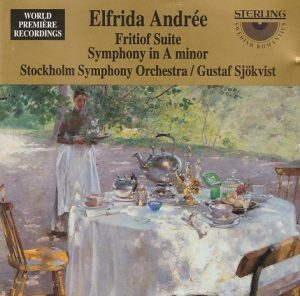 In the years since the symphony Andrée had certainly moved forward from Mendelssohn, and now the music is couched in a rather generic late-romantic style, which doesn’t mean that it doesn’t offer its beauties. There are some moments of bombast in the Prelude, but beautiful lyricism and fine pathos in the other movements, and even moments of great epic sweep orchestral invention that, finally, rise above the generic and seem to point in the direction of Sibelius. TT 57:33. Given the great vogue these days of everything “feminist”, I am confounded that there isn’t more music of Elfrida Andrée on CD, and that so little has been added since this 1995 publication from Sterling: a little bit of her piano music, a little bit of her organ music, a little bit of her chamber music, and that’s about it. Andrée’s ordeal at getting her symphonic music performed and recognized seems to continue. You mean, she wrote an opera with Nobel prize Selma Lagerlöf, and it hasn’t been recorded yet? What are the Sweedes doing with their national heritage?